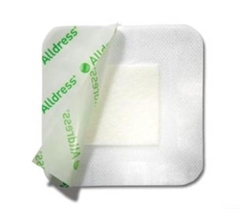 Alldress is an all-in-one self-adherent absorbent dressing ideal for a wide variety of low to moderately exuding wounds as either primary or secondary dressing. The backing film provides a moist wound environment and protects the wound from water and contamination. Is has a highly absorbent pad for excellent exudate management. Alldress has an easy-to-remove protection paper that allows for convenient and aseptic application. The low adherent wound-contact net minimizes disturbance to the wound. And the skin friendly polyacrylate adhesive provides gentle and secure fixation. A breathable film provides a moist wound environment. Alldress also features a viral and bacterial proof backing film for safety and protection. -	Primary dressing for open and closed wounds, e.g., diabetic, venous and pressure ulcers, surgical incisions, lacerations, and superficial burns. o	Alginates such as Melgisorb® and Melgisorb® Ag. 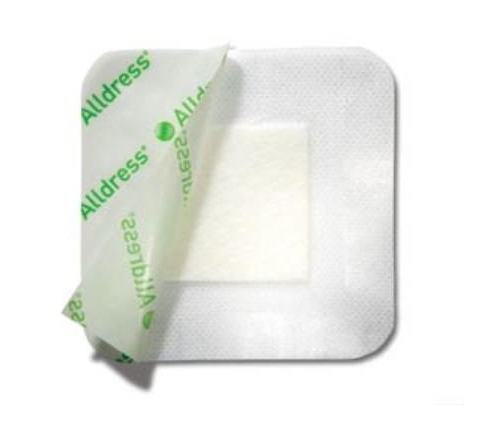 Alldress has a low-adherent wound-contact net. The absorbent pad absorbs exudate and minimizes the risk of maceration to the surrounding skin. The gentle water-based adhesive keeps the dressing securely in place. The semi-permeable film maintains a moist wound healing environment and is viral and bacteria proof. The backing film provides a barrier to fluid strike-through, and the smooth surface reduces the friction from bed linen and clothing and potential disturbance of the dressing. Kendall Curity Cover Sponges Comfeel Plus Ulcer Dressing Elta SilverGel Clear Gel McKesson Universal Utility Scissors 7-1/2"